Hello, Today I wanted to show these neck patches, which belong to a bluse of King Ferdinand of Bulgaria. A merchant offered it to me and it was in my hands, but a superior bid did not keep me. Thank you very much, very grateful. Which Bavarian Uniform is this? Thank you very much for showing us this medal. I had heard a lot about these "medals bars", but I had not seen any. 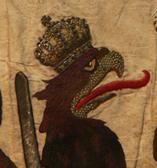 Below shows the detail of the embroidery.